‘I don’t need Personal Branding, that’s just for the ones who want to blow their own horn.’ I can hear you say? Well – here is the reality: as much as you don’t think you need Personal Branding, this is as much of a reality as Personal Branding is about you. Whether you like it or not – people categorise other people based on the perception they get and form their opinion on the touch points they have with them and their presence, online and offline. In fact, it takes us only about 7 seconds to make up our mind about someone about their political view, profession, … and most importantly – whether we want to engage with them - personally or professionally. Good news: we can take control of what other people think about us by the way we act, interact, dress and most importantly - how we make them feel about themselves. So we may as well take advantage of it and shape it the way we want. Brands are Promises about what we can expect and we use it as reassurance to make the right decision and avoid disappointment. We buy on Emotions and justify with Logic. Brands are tapping into an underlying and deeper motivator that makes us act - emotions. People act when they encounter emotions - good and bad ones. Because those emotions are the trigger to release dopamine to the brain, the chemical that makes us feel good and plays a role in our mental health. When the brain is functioning properly, we receive a positive reward in the form of pleasure and this is what makes people get to do something. It's not logic alone. 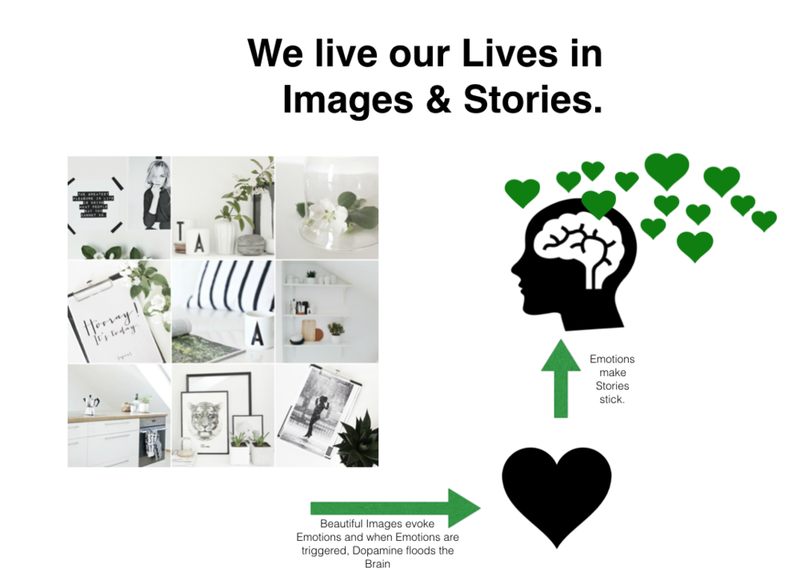 Images and Stories can trigger those emotions, that's why Social Media is such a powerful Medium for building our Brand as we can not only tell (logic) but show (emotions) who we are, what we do, why we do it and what benefit it can bring to others! As much as we pay a premium for brands we trust because they tap into our emotions and give us not just a solution but the feeling we are after through promises and motivators like – ‘just do it’, ‘think different’, ‘Vorsprung durch Technik’ … we also want to be around people that give us the reassurance of elevating us, our output and our brand. And this is where the Power of Branding comes in - through clear Differentiation to others that make you stand out and makes you more valuable to others. So as much as brands use their tagline to attract and convert their clients, the same principle applies for Personal Brands - through your 'tagline' (= Personal Brand Statement). Whatever your ideal answer is, that should form the basis of your authentic Personal Brand, which studies suggests, estimates for around 30% of career success. You want a pay rise, a promotion, win over a new client at a pitch … but what can you offer them in return? Personal Branding is about showing what value you can bring to others. Having proof of a track record of your success by not only telling but showing your approach is the powerful tool you need to leverage to get ahead. Knowing how you have overcome obstacles or solved problems in the past will also make you realise your superpower. You will soon identify the common nominator that makes people come to you as it is your approach that resonates with them when it comes to solving their underlying problems. This is what makes up your uniqueness and with that, the story you can tell. People follow people because they trust their ability to lead them in the right direction. It is the confidence that attracts us in others that make us follow someone. If you however, doubt yourself and undercut your credibility, how should anyone ever take you serious? You don’t need to be pretentious or arrogant in the way you communicate but cutting out a few of those commonly used phrases that shout ‘uncertainty’ or ‘lack of confidence’ from the roof will help you raise your profile straight away. Rather than saying ‘I think we should do …’, just put it out there what you think. ‘Doing a social media audit will show us where we stand’ has a very different impact to ‘I think we should consider doing a social media audit’. Your Brand is a combination of everything you do, say but also how you look. Dressing like an authority but wanting to come across as the approachable spiritual coach causes inconsistency which immediately reduces your trustworthiness. I don't want you to go out and spend a fortune on designer clothes either to make the impression you are the best person for this CEO role. It is more about aligning your personal Style with your goals and your personality. And no matter what your style is, you want to always have clean, sleek, flattering and comfortable clothes that represents who you are and how you want to be perceived. And just because it’s the weekend doesn’t mean you can let yourself go. You never know who you run into when grabbing your morning coffee. So find your style and amend it for different occasions. This takes the guesswork out for you and supports your consistent message for the brand you want others to associate with you. … unless you have a ‘board of mentors’. As much as I love the idea of mentoring, reality is – it only gets you to a certain point of your goal. It is too much heavy lifting for one person to build someone else up as it is not a one fits all approach and because one person isn’t able to know everything. To be(come) big, we need to think and most importantly, act big. So instead of having only one mentor, start building a network of trusted experts, like a “personal board of advisers” to get to where you want to get to. What many don’t realise or take into consideration is that you can only come so far with advice and your own network. You need to find ‘sponsors’ and ‘advocates’ that help you put the pieces together and connect you with the right opportunities and their connections. Sponsor. Especially women tend to be ‘over-mentored’ and ‘under-sponsored’ (aka getting in front of the opportunities that can be life changing.) These people don’t just act as your sounding board but as amplifier of you and your brand, they identify strength in you that you often aren’t aware of. Connector. Who do you know who knows everyone? Who has the deep industry expertise you need that you don’t have in your lifetime to attain? This person is the go to expert when you need a crucial introduction. Close friend. Who doesn’t feel every now and then to hit rock bottom and just needs to vent? These are the people you turn to when you need moral support and also a reminder of ‘you are the average of the 5 people you surround yourself with’. Coach. A Coach doesn’t walk your walk and tells you what to do but walks the walk with you and is your sounding board, your critical but objective voice, from planning to execution. When I started to realise I need to build a Personal Brand if I wanted to not only survive but thrive in a service based Industry, it took me ages to find the right people who can teach and show me what I needed to know. So I had to figure out a lot myself which took a lot longer than it could have. However this was my driving force to do what I do now - running Workshops on Personal Branding to make it easy for others to get expert advice from one place which is in sync, easy to understand and immediately to apply. ELEVATE YOUR BRAND: Full Day Workshop to not only define your Personal Brand but also your Style, teach you how to present yourself on camera before you get professional head shots done and learn how to build a compelling presence online. I'm building Brands since 2006. Let's build yours!